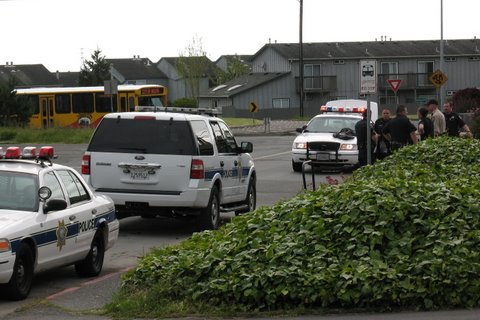 SUNNY BRAE – On Saturday, May 15 at about 4:35 p.m., officers from the Arcata Police Department responded to the 1000 block of Buttermilk Lane in Sunny Brae for the report of a male subject attempting to force entry into a residence. According to an APD press release, while en route, responding officers were advised the male subject had made entry and was threatening the residents. The man was unknown to the residents and was wielding a baseball bat. When officers arrived, the man had left the residence but was located a short distance away, still in possession of the baseball bat. Said a witness, “The guy was screaming and sounded like he was either on drugs or having a psychotic breakdown.” Officers repeatedly ordered the male subject, later identified as 34-year-old Marshall Benedict, a traveler from Eureka, to drop the baseball bat. Benedict refused and continued to rant and swing the baseball bat toward the officers. Officers deployed a Taser and pepper spray, which were ineffective in bringing Benedict under control. An Arcata Police Department patrol service K-9 was also deployed in an attempt to subdue Benedict. APD officers and Buttermilk Lane residents discuss the incident after the suspect was taken into custody. Benedict was eventually taken into custody and transported to Mad River Community Hospital for treatment of his injuries and observation due to his level of intoxication. Benedict is currently on parole for a previous weapons violation. Benedict was booked in to the Humboldt County Correctional Facility for alleged violations of 422 PC, criminal threats, 245 PC, assault with a deadly weapon, 459 PC, burglary, 11550 H&S, under the influence of a controlled substance and 3056 PC, parole hold. This entry was posted on Saturday, May 15th, 2010 at 11:57 pm	and is filed under News. You can follow any responses to this entry through the RSS 2.0 feed.